Solid microparticles or nanoparticles and molecular aggregates formed by surfactants are dispersed in solutions in order of nanometers to submicrons. Static light scattering (SLS) is an excellent method that can nondestructively observe the aggregation number and detailed size information of these particles. Application of functions specific to nano- and microparticles has become active, and information of particles in the size and shapes mentioned above have important value in academic and industrial research. Various information can be obtained from SLS, for example, the molecular weight, the inertial radius, the second virial coefficient, and the aggregation number of colloidal particles in the solution. Additionally, information of the shape and size of particles can also be obtained. Analysis methods are classified as Debye plots and Zimm plots. To explain it more simply, small particles can be analyzed by Debye plots, while large particles are analyzed using Zimm plots. 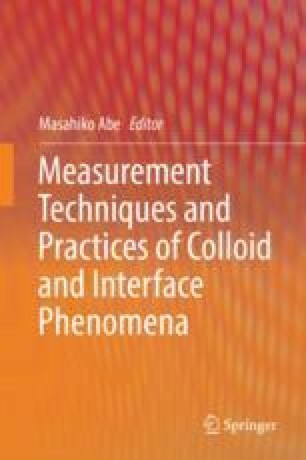 The principle and details of analysis methods by SLS measurement will be described in this chapter.